TORONTO - Despite dropping their fifth straight pre-season game and being outscored 17-7 in those losses, Maple Leafs head coach Mike Babcock is happy with the progress his club has made since the start of training camp. 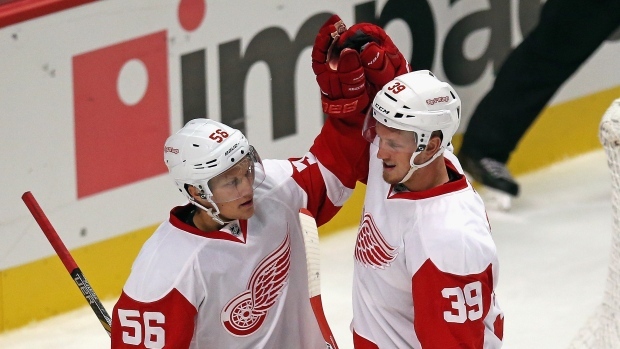 Andreas Athanasiou and Anthony Mantha each had a goal and an assist on Saturday to lead the Detroit Red Wings to a 2-1 win over Toronto in the final exhibition game for both teams. "I think we've made significant progress, but in particular, here of late, it shows more," said Babcock. "I think when you're making progress early and the increments are so small, you can't see it, you can't tell. Don't get me wrong, I would've liked us to get five (goals) tonight, but I'm a big believer in process." Brad Boyes had the lone goal for the Leafs (3-5-0). Petr Mrazek made 28 saves as Detroit concluded the pre-season with a 6-0-2 record. Jonathan Bernier made 13 saves in the loss. Babcock was particularly pleased with the play of Nazem Kadri, who had a team-high four shots on goal and led all forwards with 20:35 in ice time. The 24-year-old centre had multiple opportunities to get Toronto on the board when the game was still scoreless. Kadri failed to connect on a 2-on-1 pass from Boyes five minutes into the first period. He had another chance three minutes into the second, but fanned on a one-time attempt from Boyes. "I thought Kadri had the best game I've seen Kadri play," Babcock said. "I don't know if I've ever seen Kadri play like that." Tempers boiled over between the two clubs, who were playing each other on back-to-back nights, in the third period. After Toronto's Richard Panik caught Tyler Bertuzzi with an open-ice hit in the Red Wings zone, Athanasiou delivered a big hit on Peter Holland behind the Leafs' net. "(Mantha) was saying the whole time he didn't want to fight, so I said, 'ok we're done' and then the linesmen came in and he threw an absolute haymaker, which I thought was kind of gutless," said Holland of his brief fight with the Red Wings prospect. The Leafs will have a day off on Sunday before returning to practice on Monday. Toronto's roster, which currently has 40 players, has to be trimmed to 23 by 5 p.m. ET on Tuesday. According to Babcock, the roster decisions have already been made. "Lou (Lamoriello) and I have talked. We just haven't announced anything," he said. "I don't know when Lou is doing that. We've been through the process."